Whisk together the flour, sugar, baking powder, baking soda and salt in a large bowl. In another bowl, whisk together the buttermilk, butter, eggs and lemon peel. Mix the wet ingredients into the dry ingredients, just until blended. Spoon batter onto hot waffle iron. Cook until crisp and brown; keep warm and set aside. 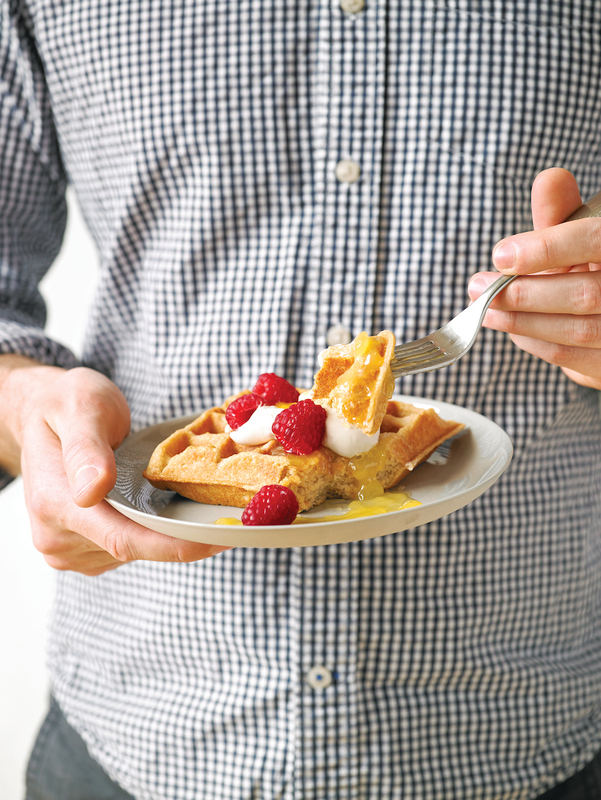 Serve with whipped cream, lemon curd and raspberries. LEMON CURD: Make a double boiler by simmering 2 inches of water in a medium saucepan. In a heatproof bowl, whisk together 4 egg yolks, ½ cup sugar, ⅓ cup fresh lemon juice, ¼ cup grated lemon peel and ⅛ teaspoon salt. Set the bowl over the simmering (not boiling) pan of water. (Water should not touch bottom of bowl.) Whisk constantly until the mixture reaches 170°F. (The mixture should thicken and form ribbons when the whisk is lifted from the bowl.) Immediately add 6 tablespoons Darigold butter (cut into ½-inch pieces), 1 tablespoon Darigold heavy cream and ¼ teaspoon vanilla extract; whisk until mixture is smooth. Place in a covered container and refrigerate. Makes about 1½ cups.